It is becoming very common for General Contractors to offer “Design / Build” services. However, Design / Build can be a misnomer, so we want to clarify what that service entails. We refer to the Design / Build approach as “Negotiated Work” because it necessitates engaging a Contractor early in the project timeline to negotiate the project cost and scope by controlling the design parameters in order to eliminate multiple cost and schedule risks. Unless the general contracting company holds an actual architectural license under their business (and some do) you are not truly receiving a design / build service from the contractor. 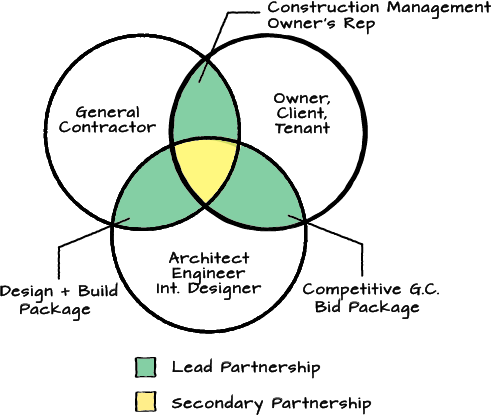 The general contractor is simply positioning their company between you (the Client) and the Architect. This is not necessarily a bad thing, but there are pros and cons associated with this approach that are important to understand. At times the Owner may want a third party perspective and will enlist a Contractor to guide the design process by prioritizing cost and constructability. This falls into the “Construction Management / Owner’s Rep” category and includes services such as value engineering and progress estimating. These services are often described as “Preconstruction”. In this arrangement, the Client is contracting directly with both the Architect and the Contractor, and the client is taking the leadership role. If Design is the primary concern of the client, they may seek a Competitive GC Bid Package from the Architect, where the Architect completes a partial or complete design package and then solicits competitive pricing from contractors. The Architect creates a baseline set of standards for bidding, resulting in cost proposals that are based on the same standards and which can be compared equitably. Under this arrangement, the Client is also contracting directly with the Architect and the Contractor, but the Architect is taking the leadership role. The Architect is often engaged throughout the entirety of the construction process to verify that the Contractor is estimating and performing the work in accordance with the contract design documents. Lastly, we have the Design / Build arrangement, which emphasizes cost and constructability considerations during the design process to both shorten the design phase and control costs up front. In this arrangement, the Client contracts with the Contractor rather than the Architect, and the Contractor takes the primary leadership role. What are the negatives associated with a Design / Build approach? It is safe to assume that whenever there is a middle man between yourself and the party providing a service to you, there is an added markup cost instituted by the middle man. That’s not necessarily unwarranted as the middle man should be compensated for the time and effort required to coordinate the other parties. Consider a legal conflict mediator or a language translator. In these instances the middle man can help two parties, whom may not be speaking the same language or whom are coming from completely different perspectives, meet in the middle and reach understanding. That’s a valuable service. However, you should be wary of the middle man taking advantage of the ignorance of both parties. In the case of Design / Build, the Contractor has the ability to push the architectural fees down and the client’s fees up, disproportionately increasing their slice of the pie in the middle. This potential for additional markup exists every time there is a design change, regardless of whether it is requested by the Client or required by the building inspectors or permitting department. So caveat emptor. (This would be a good time to Read About Our Core Values). By nature of our respective roles, the Architect (incl. Interior Designer) is actively in tune with current design trends, what’s cutting edge and appealing. They bring a creative mind set that is less restrained by cost factors. The General Contractor, on the other hand, operates in an extremely competitive market and is constantly focused on finding the most cost effective building methods and materials to reduce their pricing. When the General Contractor is leading the way on design, they are more likely to take a cost-restricted approach that is less creative. The are many factors that may determine what side of the scale you want to emphasize such as client preferences, the product type, the intended use, and long term planning. Placing the General Contractor in the driver seat may result in more cost effective, but less cutting edge design. Also, if you are very hands on and highly preferential, this may not provide you with a satisfying amount of control. So what are the positives to a design / build approach? The real down side to a competitive G.C. bid package is that the design phase must be substantially complete (50% or more) in order to solicit real costs from multiple contractors that will actually be comparable. The higher the percentage of design completion, the more likely you are to get realistic and comparable pricing. When in doubt or when assumptions must be made, the price goes up, period. This means you have to wait until your design is mostly complete to release an Invitation to Bid (ITB). Most projects under $5,000,000 require at least month in total to solicit, receive, and compare bid packages. The larger the project, the longer the bid process requires. Most projects incur some design and scope revisions after the first round of competitive bidding, once costs are brought to light. This results in additional delay for design revisions and a second round of bidding. If you’re lucky, that’s the end of it, but we have seen this back and forth of bid revisions extend far beyond two rounds, resulting in substantial delays. Upon receipt of the contractor bids you may find that some aspect of the Architect’s design has inflated the project costs beyond your budget. At this point, your only recourse is to pay the Architect (additional costs) to revise the design (additional time) and then solicit revised bids (even more time). Every revision to the original design parameters costs the Client time and money. Moreover, it provides the Contractors with an opportunity to increase their margins even if they are decreasing their costs overall. You may be getting a better cost, but if the alternative had been identified up front your savings potential is much greater. Bringing a Contractor in early to negotiate the project cost and scope by controlling the design parameters can eliminate these risks. You might have noticed that we did not specifically state “Reduced Costs” as a benefit to the Design / Build approach. That’s because even though some costs may be eliminated, it may not result in the lowest price overall. It can, however, be the quickest route to breaking ground and project completion and depending upon your circumstances that may be more important. When we engage in a Design / Build partnership, we always ensure that it is the best value package, if not the cheapest option.